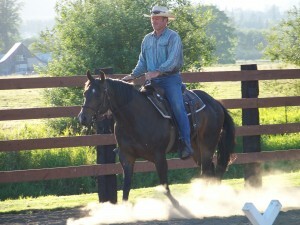 Pye came to the farm in 2010–if you have the horse disease, you will understand how I found him–always looking at horses for sale, whether I need one or not. Took one look at that gorgeous head shot of him in the ad and had to go meet him. Brought him home and of course what a gentle, good-natured boy. Started him with the Clinton Anderson method and after many miles, he’s proving to be a good citizen. He has lots of fans already waiting to riding him in lessons. He will excel in the Challenge Trail Course.